I know, I know. Two Bundt cake recipes in two weeks? It’s not writer’s block, it’s just that when you’ve got house guests, and one of them says that she enjoys a little something sweet after her meal, well, you want to keep her in cake. She’s from Ohio, 80-ish, adorable and visiting California for the first time. 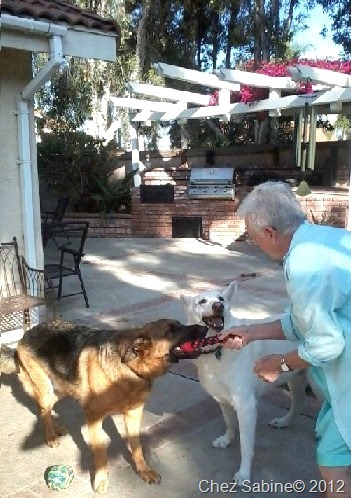 And Luke and Dexter love playing tug of war with her each morning. We quickly ran out of the Old-Fashioned Cocktail Bundt Cake, which she seemed to take a liking to. And I hadn’t yet found a permanent resting place for the pretty fleur de lis Bundt cake pan I recently bought, so another go at a Bundt cake seemed practical. I wanted to make a cake that would stay fresh for several days and one that would be perfect after a meal, and for snacking throughout the day. I love coffee cake, and this Bundt cake brings to mind a cinnamon-spiked version that’s dressed up with browned butter and a little sticky vanilla caramel. And since it was clearly turning into a winning recipe, I decided mid way through the process that the cake needed its own blog post. It also needed a name. 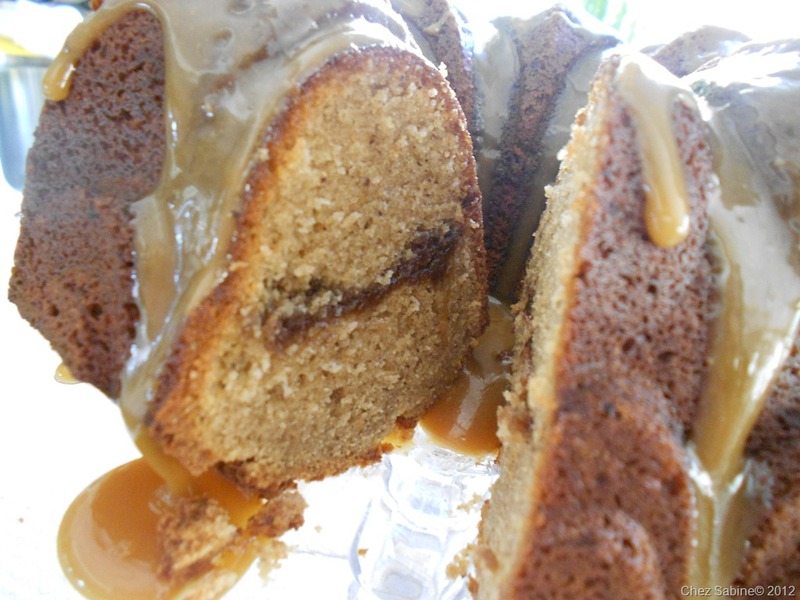 I’m dubbing it Buttermilk Spice Bundt Cake with Sticky Caramel. This lightly spiced cake boasts a moist, cinnamony ribbon running through the center. I knew it was a killer cake when someone commented that she could smell the warm aromas from the front yard as it was baking. That’s a seriously fragrant cake. 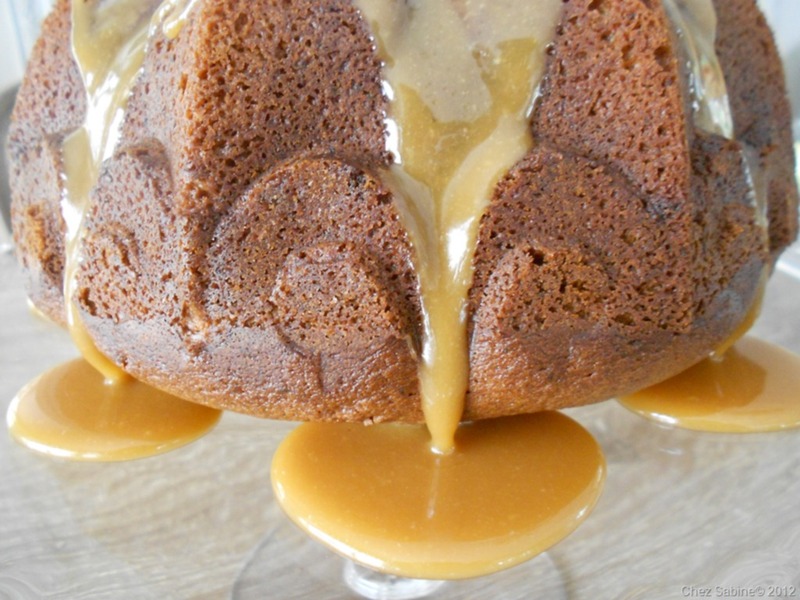 Have you noticed that many Bundt cake recipes use a similar formula? About 3 cups of flour, 3 eggs, 2 cups of white sugar and 2 sticks of sweet butter. I find that 2 cups of sugar isn’t really necessary, so I cut it back to 1-and-1/2. It doesn’t affect the texture of the cake, and it’s still sweet, but not overly so. A lot of cakes seem to be on sugar overload and that just masks the flavors. Also, for this cake, I used dark brown sugar, which I think makes for a more moist cake, and is especially suitable for a cinnamon caramely cake. And rather than using room temperature butter, I browned it – a nutty complement to the brown sugar. Within three days, this cake was but a sticky memory. Kim, thank you. And, you’re right, the good doctor would not be happy with this food choice. But you can’t please all of the people all of the time. I know I would be pleased…too bad for the Doc! I want to make this really soon! Do it, Laura. It’s really easy. 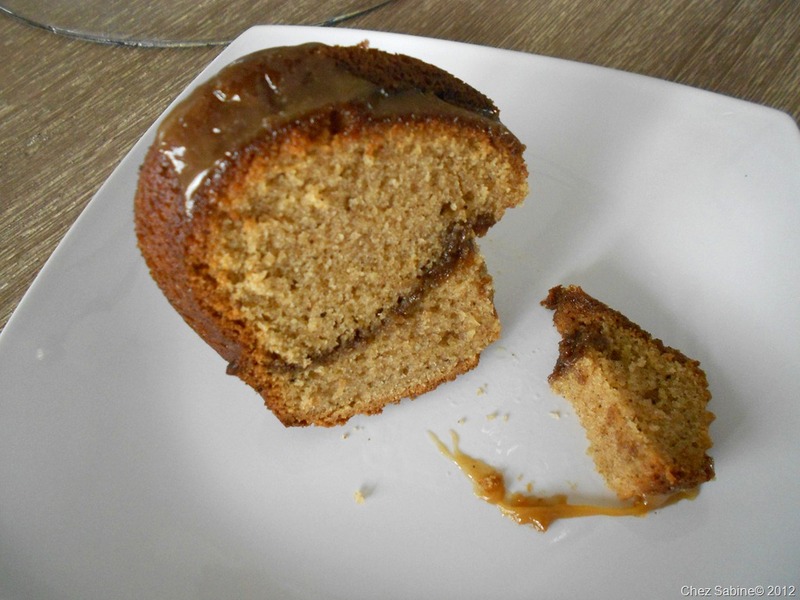 Cake, ribbon filling and simple caramel. Nothing to it. Mara, thank you for that tip. Each oven tends to be a bit different. I hope you like it once you’ve tasted it. Please let me know. Happy Holidays!